According to the company, the new Cypress CYW89359 combo solution is the industry’s first to implement Real Simultaneous Dual Band (RSDB) technology, which enables two unique data streams to run at full throughput simultaneously, by integrating two complete WiFi subsystems into a single chip. The solution’s advanced 2.4GHz WiFi and Bluetooth coexistence engine delivers optimal performance for 2.4 and 5GHz 802.11ac WiFi and dual-mode Bluetooth/Bluetooth Low Energy (BLE) simultaneously. 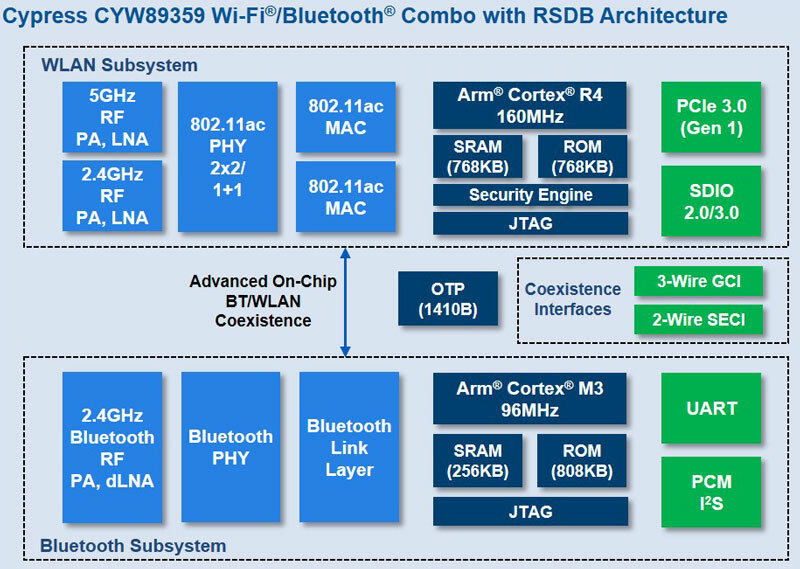 The RSDB architecture of the CYW89359 combo solution allows applications such as Apple CarPlay and a WiFi Hotspot to operate concurrently without the performance degradation caused by real time switching between Radio Frequency (RF) bands, which is required by today’s devices. “People now expect to enjoy the same connectivity, rich multimedia content and user experience in a vehicle that they get at home,” said Brian Bedrosian, Vice President of Marketing for the IoT Business Unit at Cypress.